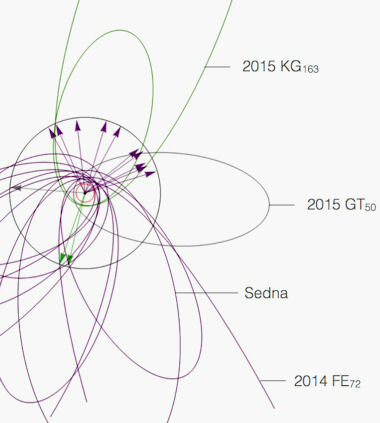 Now, Caltech's Konstantin Batygin has published an article analysing the impact of the discovery of these new extended scattered disk objects on the potential for a Planet Nine body. The short conclusion he draws is that although the objects are, on the face of it, randomly distributed, their property set is largely consistent with Caltech's original thesis (6). 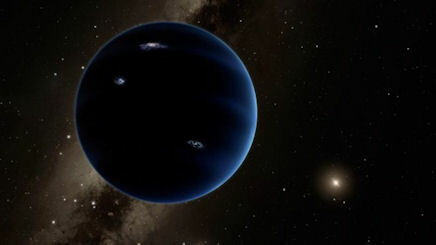 They are either anti-aligned to the purported Planet Nine body (as the original cluster is thought to be), or aligned with it in a meta-stable array. Dr Batygin goes on to say that the cluster effect is just one of five lines of enquiry pointing towards the existence of a super-Earth Planet X body. Even if the cluster argument is weakened by the new OSSOS dataset of objects (he doesn't agree that it is), there is still compelling evidence for Caltech's 'Planet Nine' object, he argues, including the mystery of the retrograde Kuiper Belt Objects Niku and Drac (8). The mechanism put forward last October for Planet Nine to generate these anomalies (9) can be successfully applied to two new objects within the OSSOS dataset (10), Batygin argues. It's good to see these arguments being thrown about so quickly, and within a public domain. Journal publications will no doubt follow, but such is the heat generated by the Planet Nine debate that there is little patience to wait for these publications, and more formal conference discussion that follows. Or else, science's battlefields are modernising on competing blogs. To some extent, I welcome this, because it provides welcome clarity and speed to this debate, wrapped up in an informed, but relatively understandable, format. It is clear that the Caltech team seem unperturbed by the new OSSOS data, and ensuing scepticism about Planet Nine. But none of this counter-argument is peer-reviewed, yet. There's one last issue I would like to point out here, above and beyond the existence of Planet Nine debate. Let's say the extended cluster does indeed point towards a Planet X body. The original cluster was very one-sided, and the Caltech team interpreted that as being the dynamically stable 'anti-aligned' orientation to Planet Nine. in other words, the bulk of Planet Nine's eccentric orbit lies in the opposite hemisphere of the solar system than the bulk of the extended TNO orbits within the cluster. In the opposite orbital diagram, the original (and now enhanced) cluster is seen in purple. Now we have two data points (seen in green in the diagram) which fall into the 'meta-stable' aligned cluster, as noted by Dr Batygin (6). Given the discussion about observational bias, it seems perfectly possible to me that as more discoveries are made, the population of this side of the fence will grow. Perhaps, in time, this side of the fence will be the dominant sector. In which case, it may be that the Caltech team have misinterpreted the initial data set as anti-aligned, when they are actually the meta-stable aligned grouping. I argued this early last year, citing evidence that Planet X is located in the opposite part of the sky to Caltech's preferred location in Orion (11). Of course, it's too early to say based upon just two new objects, but if that's the case, then, in the immortal words of Indiana Jones, "They're digging in the wrong place!" 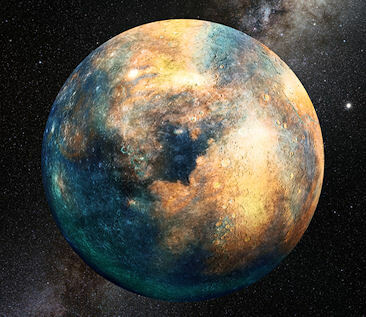 Also covered last month was another paper about Planet X, this time proposing that there could be a terrestrial-sized object (Mars-sized up to maybe about two times that of Earth), lying much closer to the outer Kuiper Belt (1). This version of Planet X is much closer than Caltech's Planet Nine (2). Astrophysicists from the University of Arizona have examined the average mean plane of Kuiper Belt Objects (KBOs), and discovered that the outermost populations of these objects have a mean plane that varies significantly from the ecliptic (3,4). They conclude that an unseen gravitational influence must be perturbing these more distant KBOs. Their calculations provide a best-fit with a not-too-distant terrestrial Planet X. This conclusion is in keeping with a previous Planet X proposal made 15 years ago by astronomers Brunini and Melita who suggested an embedded Mars-sized object at around 60AU could explain the Kuiper Gap (or sometimes 'Kuiper Cliff'), where the distribution of KBOs drops off significantly at around 50AU (5). They concluded that a Planet X body would need to have quite an eccentric, inclined orbit to account from the anomalies, and to have remained undetected for so long. "Our paper from last year was on possible orbital resonances of distant KBOs with an unseen planet (so-called Planet Nine) of about 10 times Earth's mass orbiting at several hundred astronomical units distance from the Sun." 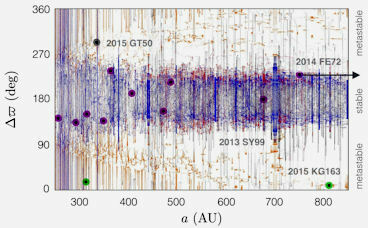 "The new paper is about the mid-plane of the Kuiper belt and its measured warp at distances of 50-80 au. We think that this warp is unrelated to the so-called Planet Nine -- that hypothetical planet would be too weak to influence the Kuiper belt's mid-plane at 50-80 au. "In the resonance work last year, the useful sample of KBOs was limited to just the 4 most distant KBOs (whose mean distance from the Sun exceeds ~200 au and whose perihelion distance exceeds ~40 au); this was because we wished to probe the effects of a very distant planet, some 10-20 times more distant than Neptune. We used the resonance work to compute the possible planet mass range and the possible planet sky location. "In the new paper, we are probing a closer range of heliocentric distances, so the KBO working sample is much larger - known KBOs whose mean distance from the Sun is between 30 and 150 au (a data sample size of ~600). We find that the KBOs whose mean distance from the Sun is between 50 and 150 au (a sample of more than 150 objects) have a mid-plane that does not follow expectations (it deviates greatly from the solar system's invariable plane). So, we have two quite different scenarios, which are presumably not mutually exclusive. The first is the Planet Nine Super-Earth, located perhaps 700AU away in an inclined orbit which is well away from the Kuiper Belt. This body may be occasionally drawing up Kuiper Belt Objects into the anomalous extended scattered disk cluster (1), creating resonance patterns with the distant shepherding body. The second scenario is that of a much closer, Mars+ sized object whose orbit largely lies within that of the ETNO cluster, but which is capable of distorting the outer sections of the main Kuiper Belt. If Brown and Batygin are correct about Planet Nine's perturbing influence, drawing up objects from the outer solar system into anomalous distant orbits, then it seems unlikely to me that Volk and Malhotra's Planet X object would be able to achieve this same effect - because it is effectively too close to the Kuiper Belt to draw objects away from it in this manner. Perhaps it is capable of shunting them outwards? Or perhaps these extended scattered disk objects originate elsewhere. It has been suggested that the retrograde KBOs, like Niku & Drac, may have been inner Oort Cloud objects originally, occasionally nudged towards the planets in much the same way as long-period comets are perturbed from their more distant locations towards the Sun (9). But if the extended scattered disk objects, which cause astrophysicists and dynamicists so many sleepless nights, have also originated from a more distant location, then how did they pick up the claimed-for relationships between them, like their similar arguments of perihelion, and other contentious patterns of behaviour (10)? Does something still need to shepherd them into their related organised orbits (which some argue can be attributed to mere observational bias)? It's not clear to me how a Planet X object embedded within the Kuiper Belt could achieve this. One would expect, instead, that its influence would create a more homogenous arrangement, in the same way that Neptune shepherds the main belt of objects beyond it. Back in 2005, I argued that a substantial PX body whose inclined and eccentric orbit creates a broad range of orbital values (perihelion ~80AU to aphelion ~2000AU) might explain why there is such a striking absence of objects between the Kuiper Belt and inner Oort Cloud (11). This seemed a highly unlikely solution at the time, because one could well argue that such an object would be dynamically unstable over long periods of time, and have a provenance which is difficult to explain. Now, everything seems wide open, with lots of different ideas as to the nature of the alleged perturbing body, and different ideas as to how it might have got there in the first place. It still seems to me that a very eccentric orbit, allowing PX to periodically gently perturb the outer zone of the Kuiper Belt, as well as the inner aspect of the Oort Cloud, is the best bet to help explain these varied issues. Efforts to discover Caltech's proposed Planet Nine object (1) have drawn in large groups of enthusiastic, eagle-eyed volunteers to sift through page upon page of infrared images of the sky (2,3) taken by NASA's Wide-Field Infrared Survey Explorer, known as WISE. The citizen volunteers are using internet platforms to access the data, and if they find anomalies as whey work through these 'flip-books' of infra-red sky-images, they can send them through to the experts for further analysis, and possible corroboration of new discoveries using powerful telescopes. The uptake of this voluntary work has been impressive, allowing professional astronomy teams to delegate a great deal of work crunching the books of slides. "While computers efficiently sift through deluges of data, they can also get lost in details that human eyes and brains easily disregard as irrelevant. However, mining this information is extremely arduous for a single scientist or even a small group of researchers. That’s precisely why collaborating with an enthusiastic public is so effective — many eyes catch details that one pair alone could miss. "While [lead researcher Marc] Kuchner [an astrophysicist at NASA’s Goddard Space Flight Center] is delighted by this early discovery, his ultimate goal for Backyard Worlds: Planet 9 is to find the smallest and coldest brown dwarfs, called Y dwarfs. Some of these Y dwarfs many even be lurking closer to us than Proxima Centauri, the nearest star to the sun. Temperatures of brown dwarfs very depending upon their age and mass, ranging from a few thousand degrees down to room temperature. The warmest brown dwarfs are known as L Dwarfs, the next warmest group as T Dwarfs, and the coolest many of which are categorised as sub-brown dwarfs) as Y Dwarfs. The known Y dwarfs range from 3 to 20 Jupiter-masses (5). This discovery may, potentially, be the first of thousands of brown dwarfs to pop up out of the WISE data. Although this new object lies some way away, and is a relatively large example of a brown dwarf along the failed star spectrum, some of the other prospective future discoveries, specifically of the sub-brown dwarfs known as 'Y dwarfs', may be found relatively close to home - perhaps even becoming the closest 'stars' yet to our Sun. The first Y-dwarf was observed as recently as 2011, and to date only a couple of dozen of these cool objects have been observed and studied. However, this small number represent the very tiniest tip of the Y Dwarf iceberg, with estimates based upon statistical analyses putting the galactic population of these objects at about a billion (6). The small number so far discovered reflects their intrinsic dimness, and thus difficulty to spot. Reading the abstract to this paper, one might be forgiven for thinking that the WISE astrophysics team are taking advantage of the popularity of the Planet Nine subject to enhance their prospect of discovering sub-brown dwarfs. (Oh, the irony!) To be fair, the search for brown dwarfs is clearly mentioned on the Zooniverse website (3), so there's nothing underhand going on here. I just find the emphasis interesting, because I suspect most of the WISE astronomers have only a passing interest in Planet X, if any at all. The human eye appears to be superior to the computational methods of spotting moving objects within the WISE images, providing the opportunity to find brown dwarf objects of about a single point of magnitude fainter than those perceived by WISE's automatic processes. 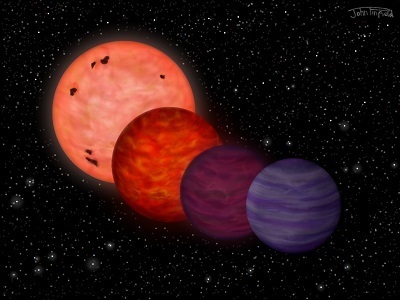 This indicates not only the potential benefits of bringing in outside help to comb the celestial beach for brown dwarf driftwood, but also the recognised limitations of WISE itself. (WISE completed its fairly short-lived primary mission in 2011, but was re-activated in 2013. Its extended mission is known as NEOWISE, which was used to identify potentially hazardous near-Earth objects). In turn, those recognised limitations provide doubt that WISE was wholly capable to eliminating Planet X from its line of enquiry several years ago, as was claimed at the time (8). The smallest ever star has been discovered using a series of different telescopes and techniques. Calculations using the amassed data from the EBLM J0555-57 system have shown this new binary star companion has a mass above the threshold for full stellar activity. At ~85 Jupiter masses, it is above the mass required for hydrogen-fuelled nuclear fusion, the cut off of which is generally held to be about 80 Jupiter-masses (1). This is the boundary between brown dwarfs (failed stars) and red dwarf stars (2). So, this puts EBLM J0555-57Ab into the category of red dwarfs, whose mass range extends from this mass up to about half that of the Sun's. What is remarkable about this particular object, however, is it tiny size. 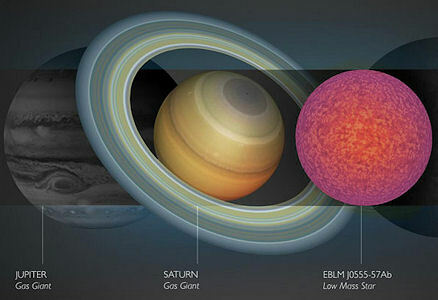 Smaller than Jupiter, it is roughly the same size as Saturn (1). This makes it a remarkably dense little star. It's true that there are categories of stars which are very dense, in fact way denser than this. But these tend to be stellar remnants, like white dwarfs, and neutron stars. These objects, although quite small in size, are incredibly dense. The least massive known white dwarf is still more massive than the Sun, for instance, and neutron stars take the degenerate evolution one step further to a crushingly high density where this type of 'compact star' may have a diameter of just a dozen miles! EBLM J0555-57Ab does not fall into these categories (or, indeed, other more exotic versions of compact stars). As the authors of the paper note, the measurements of the tiny star remain consistent with models of low-mass stars (3). Instead, it becomes the smallest known red dwarf star, sitting very close to that brown dwarf/red dwarf hydrogen-burning boundary. EBLM J0555-57Ab thus beats the previous holders of the 'smallest star' mantle: OGLE-TR-122b (discovered in 2005), a tiny red dwarf in a binary star system, which is about 20% larger in size than Jupiter, but one hundred times more massive (4); and latterly 2MASS J0523–1403, a tiny red dwarf located about 40 light years away which was discovered in 2013 (2). 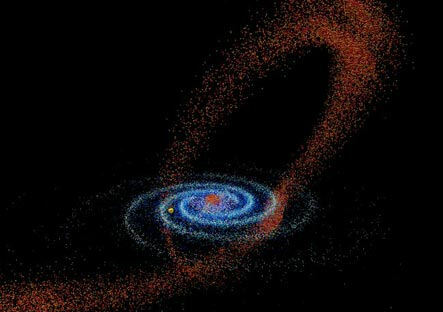 Computer simulations run by a team of researchers, led by Daniel Angles-Alcazar of Northwestern University, Illinois, have shown that about half of the material in the Milky Way galaxy may have originated from other smaller galaxies (1). This startling find opens up a whole new debate about the movement of materials within the universe, and provides evidence that we're all at least partly composed of matter which originated from distant galaxies (2). This finding also potentially adds fuel to my own arguments about the mass movement and accretion (or clumping) of materials from and within a variety of environments, and how this ebb and flow may account for missing matter, and missing planets (3,4). It's long been understood that although galaxies are generally shifting away from one another within an expanding universe, they sometimes end up on a collision course with each other, merging and exchanging materials (5). We're not immune: The spiral shape of the Milky Way results from a long-term interaction with (and cannibalisation of) the Sagittarius Dwarf galaxy. This small galaxy has been getting shredded by the powerful gravitational tug of the Mily Way, leaving streams of debris swirling around our galaxy in its wake (6). There's more trouble to come: Another galactic neighbour, the Andromeda galaxy, is heading our way at about seventy miles per second, and will collide with the Milky Way in about four billion years, followed relatively quickly by another interaction between the resulting newly merged galaxy and the Triangulum Galaxy (7). You might imagine that this 'big-fish-eats-little-fish' scenario may be sufficient to explain inflows of materials from other galaxies. Indeed, up until this new publication, it was thought that perhaps just 20% of matter in our galaxy was derived from external sources (2). However, the new research indicates that on-going movements of gas flowing between galaxies adds a significant new dimension to this picture, bringing that figure up to 60% for a galaxy the size of the Milky Way. This matter, moving unseen in the dark space between galaxies, is swept along on galactic winds generated by supernovae. As galaxies age, the effect of this inflow of intergalactic dust begins to dominate the accretion mechanisms within larger galaxies (like the Milky Way) over, say, the internal recycling of in situ materials. This causes something of a headache for astrophysicists, because as the natural recycling processes within galaxies proceed, through the lifecycle of stars and reuse of heavier elements generated from the interiors of ex-stars, the metallicity of the galaxies should increase. If the accretion of new stars is now dominated by in-coming materials blown off by other galaxies, then this may bring into question the simplicity of this age correlation with observed stellar metallicity. One will no longer be able to assume that the more metallic stars formed simply from recycled materials generated by prior novae. Instead, in older galaxies, much of that material may have been derived from elsewhere. Astronomers may now seek to study the relative metallicity of the in-coming streams of materials, compared to that of our own galaxy, which may offer the opportunity to put these computer simulations to the test (2). Either way, the result may be a complex melange of material from various sources, of varying metallicities, and thus varying building potentials. This later point may be important for my own studies on the importance of interstellar dust for interstellar planet formation (4). If in-coming materials from other galactic sources are simply composed of the lightest elemental gases, like hydrogen and helium, then their impact will be confined to the creation of new stars, of low metallicity. However, if these transferred materials are richer in complexity (as one might expect from older local galaxies), then that inflow might include more dusty materials which are capable of clumping together to form sub-stellar structures like free-floating planets. Indeed, if the calculations described in this paper are correct, then the implication is that our galaxy is enjoy a steady inflow of a great deal of gas, and quite possibly immense quantities of extra-galactic dust, too. For me, this finding increases the potential for dust-associated complexity outside the heliospheric bubbles surrounding stars. I'm trying out a new painting style for quirky townscapes, inspired by the contemporary French artist Alain Godon. Mrs DarkStar and I have been fans of his work for a few years now, especially his paintings of buildings in Le Touquet, France, which we quite often visit. 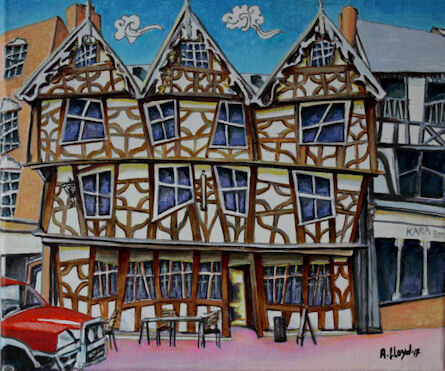 This new painting of mine is of Robert Raikes House in Gloucester, which, for me, is much closer to home! I'd be interested to hear what you think of this new artistic departure.